ONCE; A New Musical – The Small Things. Happy hump day! I hope everyone is feeling alive and well in the aftermath of St. Patrick’s day. When I was in university St. Paddy’s was a big deal. Anyone and everyone busted out their green and went overboard on green beer. It was fun while it lasted but out in the real world that type of behavior is totally inappropriate for a weekday, weekends are still fair game though. This year, instead of celebrating the luck o’ the Irish with booze, Lucas and I decided to celebrate with Irish music by seeing the musical production ONCE, at the Ed Mirvish Theatre. In addition to being a fun St.Pat’s date night activity, tickets to the show were one of my birthday gifts for Lucas. Before the show Lucas and I decided to go for a nice dinner, because #datenight. We selected a restaurant called Baton Rouge. Lucas got a super delicious looking burger and fries. It had onion rings on it! Mmmmmm! And I got a grilled veggie sandwich and a green salad (eating out isn’t as fun when your not allowed to eat deep fried foods but it was still very delicious). Then we went to the show! The Ed Mirvish Theatre is one of my favourite places to see theatre. There really isn’t a bad seat in the house (as long as you’ve got your glasses) and the architecture and design is just stunning! High arched ceilings, elegant stair cases, ruby red carpets and curtains! I’ve now seen 6 shows there! Set in modern day Dublin, ONCE is the story of a Guy who gave up on his music—and his love—and the Girl who inspired him to dream again. This irresistibly breathtaking production is performed by an extraordinary all-Canadian cast of actor-musicians who sing, dance and play their hearts out live on stage. Directed and choreographed by the brilliant team of Tony Award winner John Tiffany and Steven Hoggett, ONCE will dazzle you with its originality, wit and unforgettable music. The stage was set to look like an Irish pub and during pre-show and intermission audience members were allowed to get beer and water from the working bar on stage! How neat is that?! While people lined up for drinks the performers danced around singing popular irish folk tunes. Talk about audience interaction! It perfectly set the mood for the show! The music was excellent. Absolutely beautiful! Unlike traditional musicals the instruments were played by the singers/actors on stage. There were 2 violins, a cello, multiple guitars, percussion, and a piano. All these instruments were onstage the entire time and always played by the cast. In many productions this would have been unsuccessful but it worked really well in the Irish pub atmosphere and it showcased the talent of this cast excellently. Speaking of the cast, it is entirely Canadian! This is a big deal for me because I am extremely passionate about the growth of Canadian arts and culture. I strongly believe that the best way to grow our artistic scene to a larger scale is by having Canadian artists shine on Canadian stages. Because if Canada doesn’t showcase our talent why would anyone else. 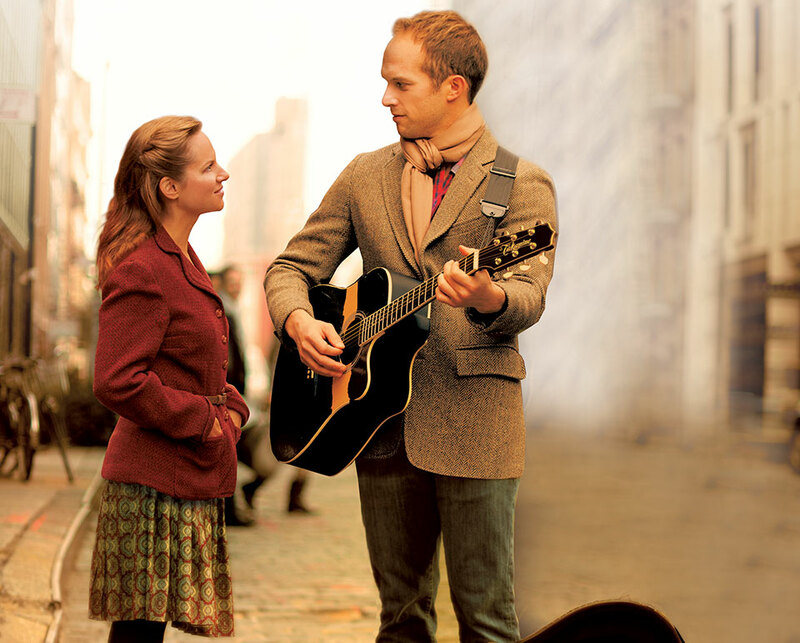 Annnnyway, the leads of ONCE were Ian Lake and Trish Lindström (Photographed below). They both did an excellent job of portraying their characters. A heart broken Irish man and a spunky, single mom from the Czech Republic. The downfall of this musical for me was the plot. ONCE is advertised as the love story to end all love stories and that is how it began. It had me getting all emotional and sappy. And then… the end happened. And while it was still beautiful it wasn’t at all what I expected. In fact it didn’t really feel like the ending at all. I was left with questions and confusion and a need for more. But I suppose that makes this musical more realistic than most. Instead of providing a clean cut happily ever after it provides an unsatisfying ending which is lacking closure, which is an accurate description to how most real life relationships are. That being said, it was beautiful, exceptionally beautiful. Even if it didn’t give me the cookie cutter ending I was craving. For the record, Lucas also really enjoyed the show. He didn’t focus so much on the plot but rather the music. He said it felt more like a folk concert than a musical and he loved that. I wouldn’t be surprised if I come home to find the soundtrack on my iTunes. All in all it was a fantastic way to access my inner Irish on St. Patrick’s day and it was a super fun, out of the ordinary date night. My final review: 4 Stars out of 5. 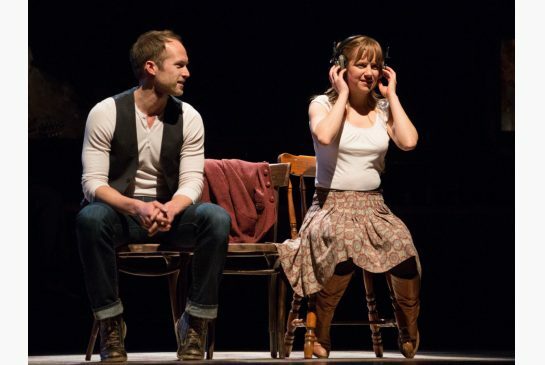 If you are in the Toronto Area and you enjoy good music, I suggest going to see ONCE! 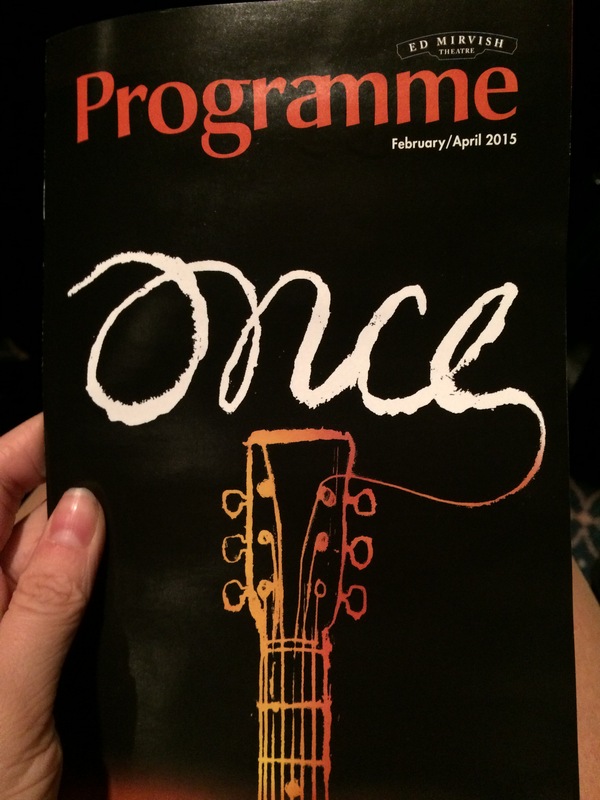 ONCE is on stage at the Ed Mirvish Theatre until May 31st. Yes! The musical is based on the movie actually! I think they added a few extra songs for the musical but other than that its all from the movie. If you get a chance to see the musical, you should! So glad to hear that you enjoyed it as well! I love how music can affect people in the same way no matter where they are!